Rated R for pervasive language, some sexual content and violence. 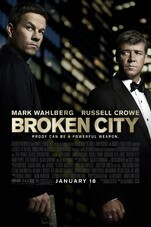 In a broken city rife with injustice, ex-cop Billy Taggart (Mark Wahlberg) seeks redemption and revenge after being double-crossed and then framed by its most powerful figure, the mayor (Russell Crowe). Billy's relentless pursuit of justice, matched only by his streetwise toughness, makes him an unstoppable force and the mayor's worst nightmare.